In both the Declaration of Independence and The Epic of America, a vision is presented that is somewhat unique among the peoples of the world. A free people are to be blessed with the opportunity to pursue their interests to the best of their abilities. 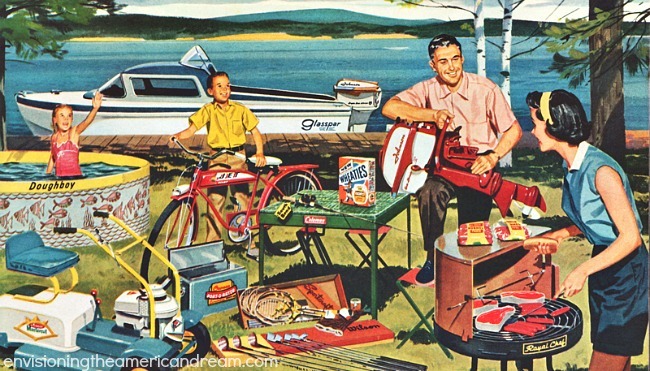 So, having defined this concept of the American Dream, one might ask, “How do I obtain this dream”? Faith in God - While faith in God isn’t, strictly speaking, necessary to pursue happiness, it is helpful in attaining it in at least two ways. First, believing in God relieves us of the stress of carrying the world on our shoulders. It’s His creation, after all, not ours and we can leave that which exceeds our grasp in His capable hands. Second, recognizing that God is greater than us means that we can’t be too cocky. At every turn, our abilities pale in comparison to His. Personal Responsibility – Following from Faith in God, we, as God’s creation, have a responsibility to adhere to His teachings, chief among which is the notion that we are accountable for our own actions. You don’t have to believe in God to see the benefit of this kind of behavior. The individual who accepts responsibility for their own words and actions, for better or worse, is generally recognized by both the religious and non-religious populations as a trustworthy and honorable person. Acceptance of Family Obligations – Caring for others, with the family being the basic unit for which to care, is critical to attaining the American Dream and, I suppose, could be defined as merely a subset of Personal Responsibility. However, in accepting family obligations, we also receive the support of the family in pursuit of our own dreams and this support, in both material and emotional ways, can be a powerful assist to our efforts. A Strong Work Ethic – As a young man, I often groaned at the thought of having to go to work. After all, hanging out with my friends was a lot more fun. As an older man who has seen the ups and downs of life, I know that having the opportunity to work is a gift. Simply put, we were made to work. There is nothing quite so rewarding as looking back over the product of our own efforts. Whether it is a newly mowed lawn, a well-made burger or a well-crafted technical report. It doesn’t matter, necessarily, what the work is, it is the sense of achievement and self-esteem that comes from doing the work well that is its own reward. The fact that diligent, conscientious workers tend to be better paid and better treated by their bosses also doesn’t hurt! Education – My brother often says that you can work hard for a few years in your youth or you can work hard for the rest of your life. His point being that obtaining an education is hard work, but, without one, you are unlikely to ever get away from doing “grunt” work for the rest of your days. Educational requirements vary, of course, and there is no guarantee that your education will bring certain advancement in your career or income. However, as with a Strong Work Ethic, an education is its own reward. It opens a person’s eyes to possibilities well beyond what is immediately in front of them and teaches new ways of seeing the world. It is also a great leveler among people. It doesn’t matter whether you were born with a silver spoon, a plastic spoon or no spoon in your mouth; a good education opens doors to many similar opportunities. Delayed Gratification – I have often commented to my own children that it isn’t the type of work that you do, or even the income that work commands, that matter. No, it’s what you do with that income. Those who can delay immediate gratification of their wants will save some portion of their income “for a rainy day.” Looking ahead and seeing the potential need for “a rainy day fund” is a sign of maturity. More than that, it is a virtual guarantee of financial success. If you don’t spend all of your money as soon as you get it, but can discipline yourself to save some of it, you will be surprised to see how quickly it grows. Better yet, that money can be put to work through investments so that it makes even more money and results in financial holdings far in excess of the original amount saved. Surveying this short list, I am struck by the fact that the first Pilgrims arriving on these shores would probably recognize these answers as their own. They are certainly not new. They are, however, a challenge to each new generation. I am also struck by the fact that these six answers are essentially personal attributes and are little dependent on the actions of others. We can truly set the agenda for our lives and find that measure of fulfillment that we seek through our own actions.